“We believe that you are one of those rare people who have both the vision of a better world and the talent and drive to make it happen. Our role is to provide you with the creativity, capability and community to help make it happen.” Kate Harris, CEO, Centre for Sustainability Leadership (CSL). I used to keep a journal during high school. Not sure why I stopped. Lazy? Probably. Busy? Definitely. Not sure of its value? Mistaken. When Matt, our amazing CSL facilitator asked how many of us had started keeping a journal, my hand itched to rise like the eager-to-please pupil that I always have been. But I had only just bought a notebook, not written in it. As I started writing my first entry today, reflecting on the last few weeks as a CSL fellow, I was struck with an urge to post the reflection publicly. There are two main drivers for this. I want my friends, but particularly colleagues, to get a deeper understanding of my character, as I myself discover it, better articulate it and learn to love it. And I want to share the resources and materials that are helping me on this path of discovery, as I see them having so much use for so many people I know. There will be typos and grammatical errors. The prose may be clumsy. There will be fear and hope. There will be vulnerability and honesty. But I hope it’s taken in the spirit it is intended – to inspire a deepened understanding of ourselves and each other. Nurturing and empowering this spirit to emerge in our society is really what I believe will lead us to a sustainable future. It’s only been a few weeks but I’m already feeling a big difference in my mindset and leadership style. This is largely due to the incredibly supportive community that CSL have very intentionally and carefully nurtured. I have an amazing goal buddy who complements and contrasts me in the best of ways. I hope that I can be of help to her as we move together in the journey this year (lurking imposter syndrome…you are not welcome here). Our first group retreat focused on going within. We were asked to reflect on our personal sustainability, our 5-year vision and writing our own obituary to articulate the legacy we wish to leave behind. I found many of these activities challenging and frustrating as I wasn’t able to articulate them as clearly as I wanted to. I’m getting more comfortable with the ambiguity (which is a good characteristic of a sustainability leader I later learned!). Completing a personal vision statement (which is kind of similar to new year’s resolutions but more focused on your core values and passions) is one way I am working through this. What are my 3 greatest strengths? What are my 3 greatest areas for improvement? I think it’s important to do this separately to an official performance review, which often has so much associated baggage. I found it helpful to state that by undertaking this process I am aiming to engender in myself the capacity to solicit and process feedback at the right time from the right people throughout my career. It’s an incredibly uplifting and humbling experience to realize that you have a community of people who are committed to helping you grow. (and people will do it, no matter how time poor they are). And you might just find that such a simple reflection may help people to understand you better and how best they can work with you. I have accepted all of these strengths and areas for improvement fully and feel energized to work on them as much as I can during the next phase of my personal and professional life. Keeping in the theme of heightening self-awareness, our first workshop focused on theory U, which is a series of reflective and active practices that enable you to better know yourself and lead profound change. It’s also a good way of finding a clear path through a complex challenge, like when a team is trying to figure out the best way to proceed together on a project (which is how I intend to use it). What in your current professional and personal situation are the key challenges, and the emerging areas of possibility, that your life asks you to address? Your key question: what questions, if explored more deeply, could help you to address your current situation better and to take the next step in your personal and professional journey? When do you feel your heart opening – what do you truly love? Imagine you could fast-forward to the last moments of your life, when it is time for you to pass on. Imagine yourself at that moment looking back on your life’s journey as a whole: what would you want to see in that moment? What would you want to be remembered for by the people who live on after you? Let’s now return to your current situation. Imagine that you could link to your highest future possibility – to your highest best future Self – and that you could ask one question to which you would get a meaningful answer: what question would you ask of your highest future self? Now, pause and stay in silence to listen deeply to the response that your future Self wants to give to you. Stay with it and then write it down. What would you have to let go of in order to bring your vision into reality? What is the old stuff that must die? Where in your current life do you experience the seeds and early beginnings of the future that you want to create? Over the next three months, if you were to prototype a microcosm of the future in which you could explore by doing, what would it look like? Who are the core partners and helpers that would help you bring it into reality, and who could support you in your highest future intention? If you committed to taking on the project of bringing your intention into reality, what practical first steps would you take over the next 3 to 7 days? What do you value and what makes you happy? The final thing I want to reflect on is my core values. 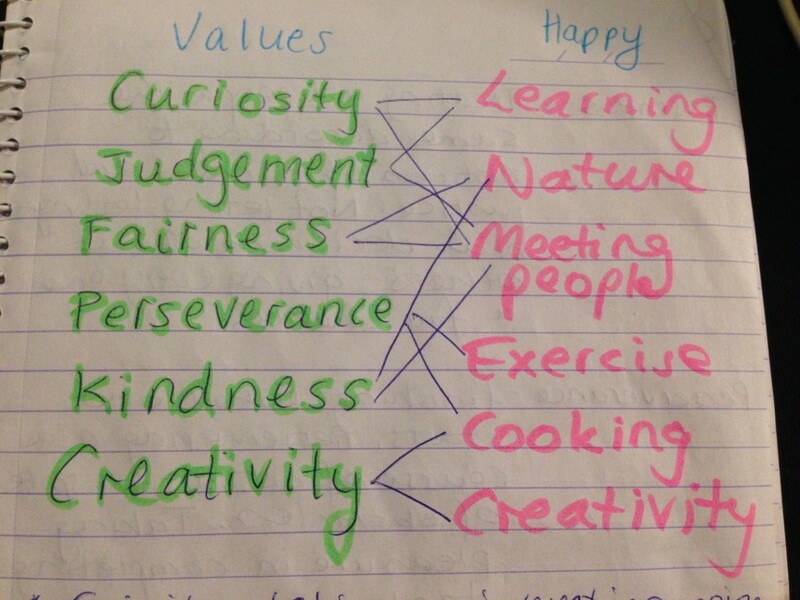 This is something that I have had trouble articulating so one of my CSL buddies, Ash, recommended I do a values assessment (see the tool I used here). Like any tool, it has limitations but once I took some time to think about the results, I found that it was quite spot on. At the same time, I made a list of the top 6 activities that make me happy. Interestingly I found a quite neat correlation between them. I suppose it makes sense – the things that make me happy, are things that embody the values I uphold. Being able to articulate this, I hope, will make it easier for me to make decisions about how to stay fulfilled. Ensuring that, at all times, I am doing at least 2 things that make me happy will help keep me resilient. Having a strong sense of my values should make it easier to make decisions about my career direction (i.e. will this opportunity align with and nurture my values?). I’ve included a definition of the values below, as some (particularly “judgment”) can be interpreted in several ways. This is now my phone background screen, so I’m always keeping my values and happiness activities at the front of my mind. Taking an interest in ongoing experience for its own sake. Finding subjects and topics fascinating. Exploring and discovering. Thinking things through and examining them from all sides. Not jumping to conclusions. Being able to change one’s mind in light of evidence. Weighing all evidence fairly. Treating all people the same according to notions of fairness and justice. Not letting feelings bias decisions about others. Giving everyone a fair chance. Finishing what one starts. Persevering in a course of action despite of obstacles. Taking pleasure in completing tasks. Doing favours and good deeds for others. Helping them. Taking care of them. Thinking of novel and productive ways to conceptualize and do things. Includes artistic achievement but is not limited to it. I’d love to hear your thoughts about any of these tools – did they work for you? What have they helped you to discover about yourself and the way you interact with others? Until next time…good luck on your own journey of self-discovery!